The oldest known living organisms on earth are trees. One of these ancient living organisms, is an Irish Oak and the other a Bristlecone pine. Calculating the growth rate of these organisms, typically producing an annual, one-two growth rings per year, the oldest known trees are between 4,500 and 4,767 years old (about the estimated time of Noah’s flood). It is necessary to note that a tree ring is an indication of a season of growth, not necessarily an annual growth ring. Thus, a tree could actually be younger than indicated if the conditions where right to have more than one season of growth in a specific year. Fig. 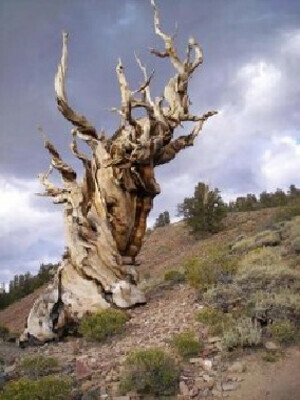 1- Methuselah is a tree estimated to have germinated roughly 2832 B.C. high in the White Mountains of Inyo County in eastern California; it is a Great Basin Bristlecone Pine. 1.) No one even know how old these organisms can grow before they will die. 2.) If their ancestors (of the trees) are no where to be found, we have to wonder then what happened to them? A simple and probably explanation would be to conclude that they where destroyed by a world wide catastrophe that would have wiped out all living land matter that was older then they where at a specific time (i.e. Noah’s Flood). Dendrochronologists (tree ring counters) are able to take the core sample of any tree and using the data found for seasons of growth, good / bad seasonal conditions and the effects it had on the trees. They can take fossilized tree samples that have overlapping rings based on the living core data and come up with a map of an extended chronology. In other words, taking a core sample from one of the world oldest trees (namely trees like Prometheus and Methuselah) dating roughly 4500 years, and combining its rings with some of the fossilized tree records (that comes to about 3000 years worth of seasonal rings) and a total chronological time scale of 7500 years was concluded from this research. Using this technique with fossilized data from around the world scientist have only ever been able to come up with an upper limit of 10,000 years for the entire age of the earth. Taking in consideration that trees uncommonly have duplicate seasons of growth, it interestingly comes within the proximity of the Biblical view of a rough 6000 year old young earth.